making: ROBYN'S FETISH CHALLENGE # 207 "MUST HAVE A HAT IN THE IMAGE"
ROBYN'S FETISH CHALLENGE # 207 "MUST HAVE A HAT IN THE IMAGE"
What a wonderful Sunday morning. We are definitely having a touch of spring here today. The weather men are saying we will have snow in the middle of the week. This is crazy weather and it is messing with my allergies. We just need the weather to stay the same now. Winter should definitely be over by now. Easter is next weekend and it would be nice to have some great weather. Next weekend is going to be really busy. My grand daughter turns 2 on Friday. Her birthday party is on Saturday and then Easter on Sunday. I also need to figure out how to go to the store to get things but I have no car right now. My husband starts a new job tomorrow and he needs the car. We are looking for something in our price range but we are having a hard time with that. The car has to be so old and the mileage has to be low in order to get a loan. Weird how they do things these days. Well, I want to move on to the challenge this week because I think it is a great one. I have this cute little image that Just Some Lines let me use. It is called EMO -- Flower Filled Day. She is a cute little girl that is wearing this big hat that is bigger then her. She also has flowers that are in front of her. I can't wait to show you this image. Just Some Lines is our sponsor this week and I love the images there. They are adorable. I hope you will check them out. They are giving a generous prize this week for our lucky winner. I'm sure you would like to know. Here it is. Here is the card that I made with EMO -- Flower Filled Day. I thought she would look adorable in a flower herself. I think every thing turned out great and matched perfectly. I am a little impressed with this one. Let me tell you about the items that I used to make this card. Well we are at the end of another Sunday challenge. You just have to make sure your image has a hat in it to enter at Robyn's Fetish Challenge Blog. Have a great Easter and I will have my post up that day also. 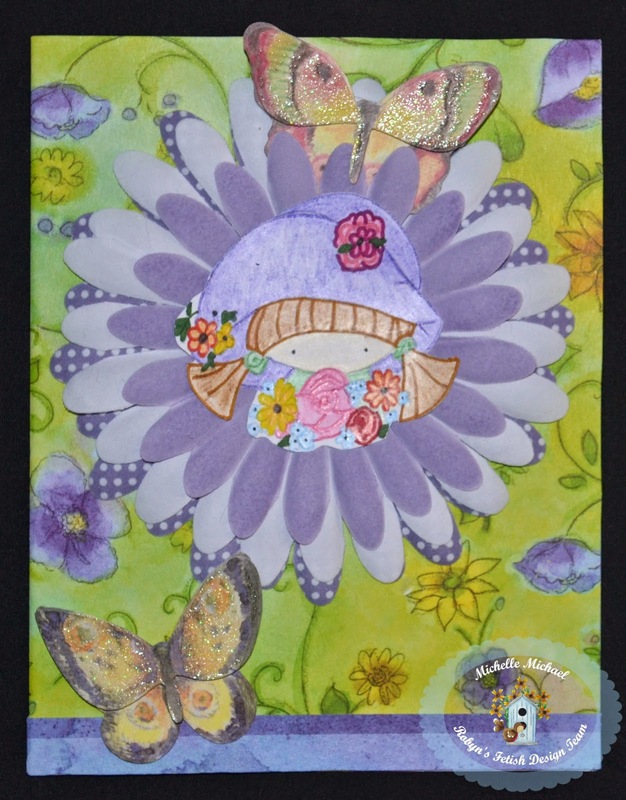 Cute card Robyn, pretty colours, great DT inspiration for this weeks challenge. Oops sorry Marlene, I was thinking Robyns Challenge. It is a cute card.